To Focus Narrowly or Broadly? In February 2011, Fast Company featured a blog post by entrepreneurship educator, Steve Blank, titled College and Business Will Never Be the Same. 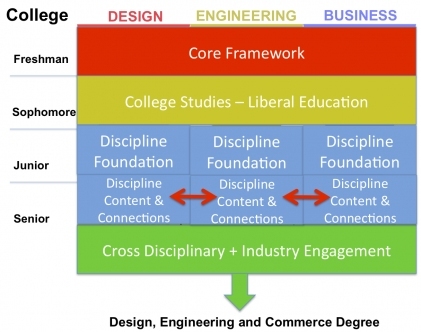 The essence of the post: interdisciplinary education that includes design thinking is urgently needed in a “volatile, complex, and ambiguous world,” and most current educational models are inadequate for the task. 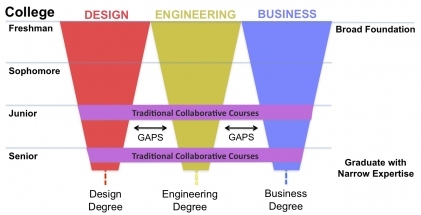 His examples of better approaches were from design education – Stanford’s D-School (a graduate program) and Philadelphia University’s new undergraduate degree in Design, Engineering, and Commerce. Blank’s post was a reaction to a question that has been in educators’ minds for some time now – a question perhaps best articulated by Colorado educator, Karl Fisch in a 2006 ppt-gone-viral video called Did You Know? Shift Happens. Originally prepared for fellow teachers in his Colorado high school, Fisch identifies some of the rapid changes occurring in the world. In the video, Fisch states “We are currently preparing students for jobs that don’t yet exist, [where they will use] technologies that haven’t yet been invented, in order to solve problems we don’t even know are problems yet.” How do we do that? What should education in a period of rapid change look like? In the Fast Company article, Blank suggests we think about the model presented by the Philadelphia University program as one response. The graphics used by Blank depict the old silo model and the new, interdisciplinary model. The business world has a lot of things to say about all of this, by the way, including talk of the need for T-shaped people, or perhaps I-shaped people, to spur innovation in companies. Does It Matter If LA Grads Get Jobs? That is, does it matter to landscape architecture educators? To any graduate from a landscape architecture program, that question sounds crazy (or worse). My own working class roots cause me to bristle at the thought. On a personal level, an emotional level, of course, it matters very much whether or not graduates of our programs get jobs. It is really a privilege to teach highly creative people, as many of our grads are, and therefore very painful to see them leave college and not find the success they deserve. I am featuring the personal stories of some recent grads in this blog because I think their experiences are important in more ways than one. The question really is, in what way does it matter to educators? Is it just on an emotional level, a hope that students you know personally will succeed? Or do the difficulties faced by graduates in the past couple of years suggest that parts of our curricula need to be reconsidered? The answer depends on whether you think the current economic upheaval is just a cyclical event and that we’ll eventually turn the corner and be back to “normal,” or you think that a major restructuring is underway. Educational institutions respond very slowly to change, and that is probably very appropriate in the case of the rise and fall of the national economy. If, however, a major restructuring is taking place, and new forces are shaping the profession in lasting ways, shouldn’t education respond? And, in the near term, shouldn’t we find ways to emphasize a breadth and diversity of knowledge and skills that help new grads be as flexible as possible when they embark on their careers?